It was a cold morning when we planned for the bike trip to Lonar crater site. Our plan was to leave Pune as early as possible and hit Shirur town, some 80 km from Pune by 4.00 pm and there after reach Ahmednagar city by 5.30 pm in the evening. Our last leg of travel from the Aurangabad city (135km) Via Jalna town, to reach Lonar crater by 12am. We left our respective homes and took the Nagar road highway, towards the Shirur town. 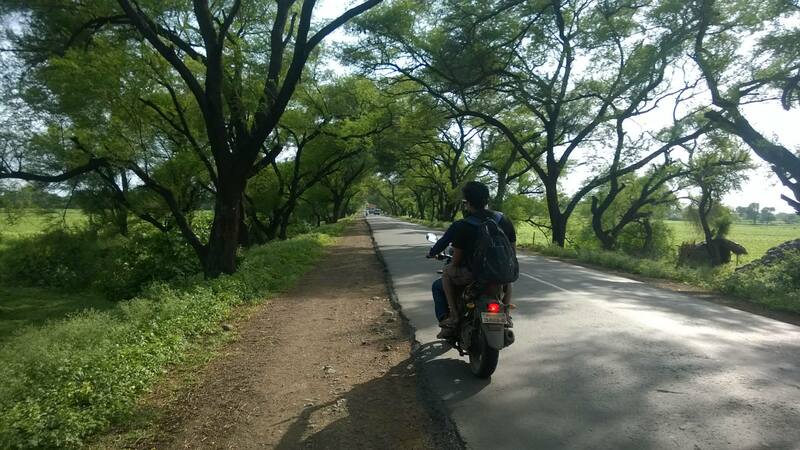 Roads were quite good even in the fringe areas and everything went as planned till Shirur. We hit Shirur town at 4.30pm. Nothing much to write about. It was just like any other bike trip. Only the duration of our bike ride was little longer than expected. We hit Ahmednagar at 7pm and then Aurangabad city at around 10.30pm. It felt good that till that time our ride was going on just per our plan. We did halt our bikes as and when needed and eat whenever we felt hungry. For our dinner we went to a roadside dhabba where we had ordered a lavish dinner. A satisfactory dinner and a revived body encouraged us to press ahead on our journey. It was already 12.30pm when we left the Aurangabad city and reached the Jalna town. The extreme exhaustion and the pathetic road conditions took toll on both man and machines. 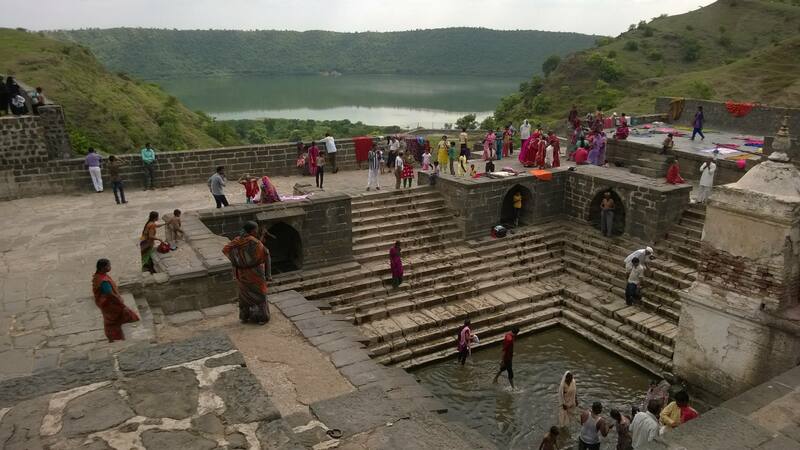 But we were determined to reach our final destination of Lonar city. Finally ! we reached Lonar at around 2.30am. The roads were a real test for our daunting biking spirit. Worst part, on way we missed a right turn which would have directly taken us to Lonar city. This simple miss took us 15 kms ahead towards Sultanapur town from where we had to take a U-turn to reach the Lonar town. This detour cost us our valuable energy and 40kms of extra riding of bike. We had a difficult time to find a decent accommodation. After 30 minutes of searching around the town we found a lodge of our choice. The moment I touched the bed, I felled like a deadwood. And so our exhaustive back breaking day ended. Next day morning, we woke up to the sight of Sun shining gloriously in the west. The time must be around 2 pm when finally all of us woke up. We quickly took a hot water shower and readied ourselves to reach the crater site. 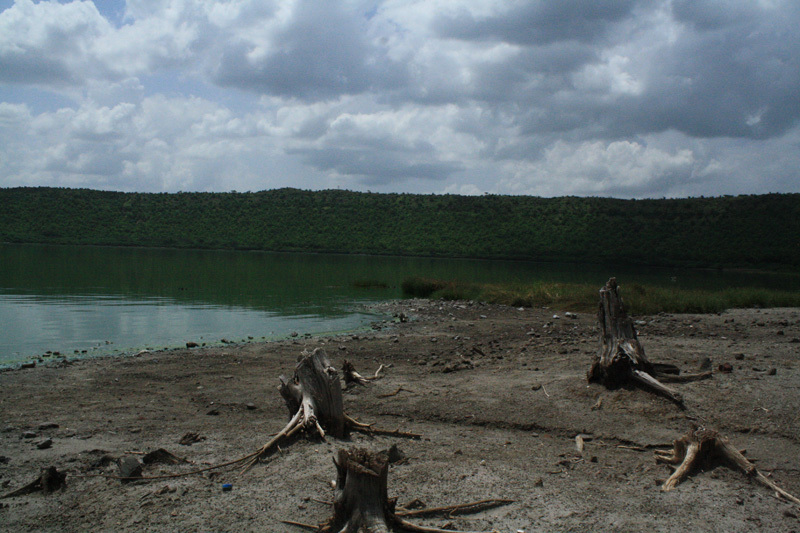 We reached the periphery of the crater from where the sheer massiveness of the lake could be seen. This massive crater with a multi colored lake and a tinge of bluish hue at the lake’s center was just gleaming under the afternoon sun. Its was simply a breathtaking view. 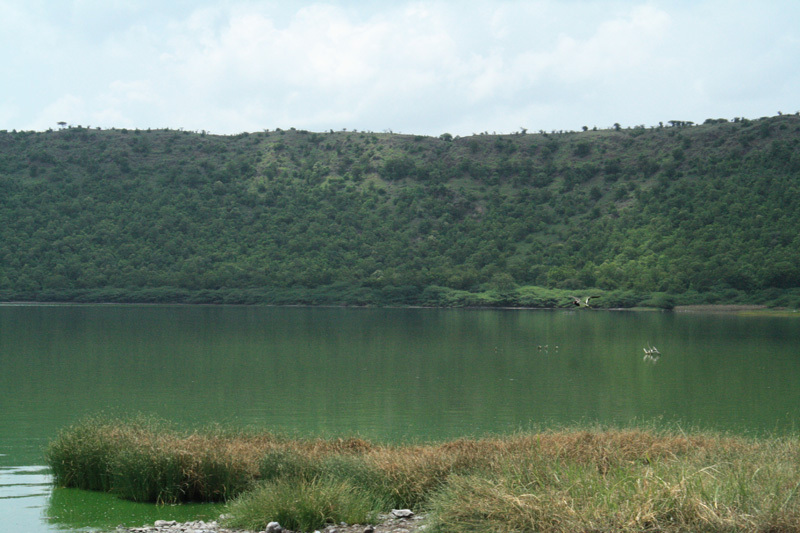 Lonar Lake is a saline soda lake which was created by a meteor impact during the Pleistocene Epoch. The average age of this crater is estimated to be around 52,000 ± 6,000 years, although a recent study published in the year of 2010 states its age to be around 570,000 ± 47,000 years.The crater has a mean diameter of around 1.2 kms and the circular depression its center portion contains a saline water lake. The lake has got mentioned in ancient scriptures like the Padma Puran and Skanda Purana to name a few. 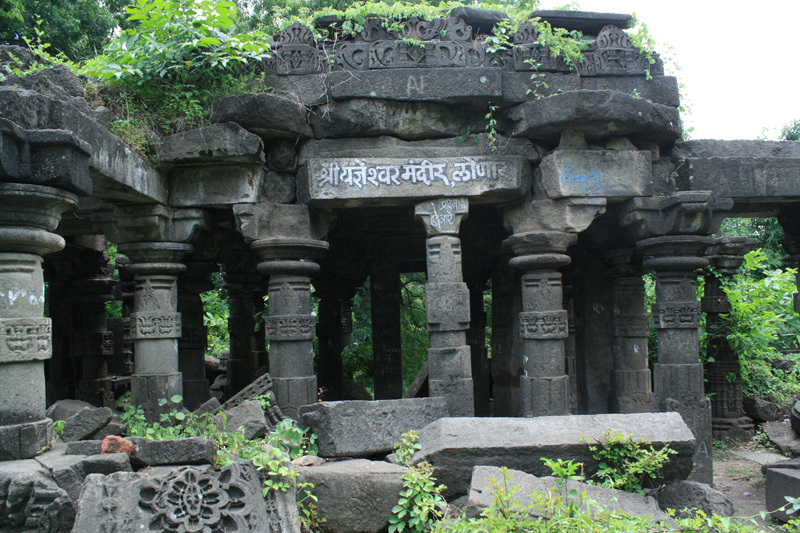 The locals of the area believes that the town is named as Lonar after the supreme God, Lord Vishnu defeated a ferocious demon named Lonasura. 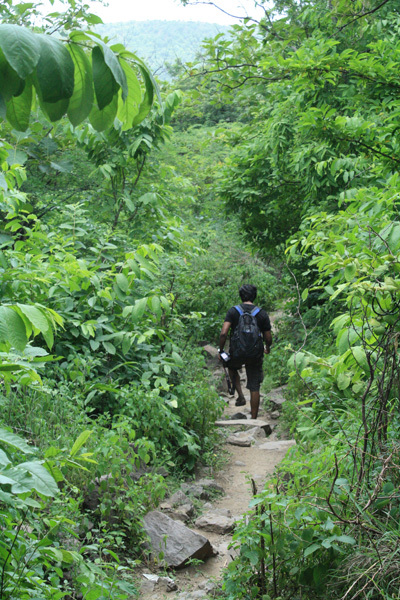 As we descended down the dusty path through the thick green cover the air felt around was too humid. The thick smell of potash and soda, felt like we were inside a chemistry lab. Our trail took us further through the thick foliage with tall trees on its periphery. 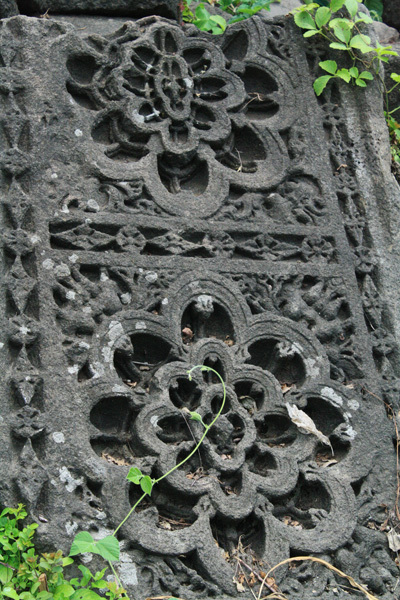 Scattered around the periphery of the lake we came across few temples all in its ruins that stands testimony to its glorious past. Jumping off two fresh water springs on way and hiking for another 1.5 hours under the sweating heat, we reached the central part of the crater that has a huge lake in its center. The lake seemed so colorful and looked so tranquil, that we decided to sit there for some time to enjoy its beauty. The entire crater lake seemed to be self sustaining with its own small ecosystem. We were able to see a lot of birds and small lizards around to click.Our hiking back to the Crater entrance took us something another 1.5 hours. It was late in the evening we reached the Crater’s entrance gate. It was already dark when we finally left Lonar crater site. The roads were lonely and the breeze seemed to have died. Only sound that we were able to hear were the distant occasional barking of dogs. The potholes and the rugged roads ahead showed no mercy and ensured further sufferings to our bums. But we kept on throttling our bikes for miles and miles ahead. We didn’t took a halt at Shirur town. So it turned out to be a continuous ride for the last 2+ hours with 100km already covered. A real test to both man and machine. We had to take a break, after we crossed the Shirur town. It was not for our dear bums but for our bikes. The last few kilometres (from Viman Nagar to Wakad) after hitting Pune was just a hard hit for all three of us. We found ourselves on our respective beds at 4.15 am. A long peaceful sleep after all the back breaking exhaustive bike ride, felt like Heaven. 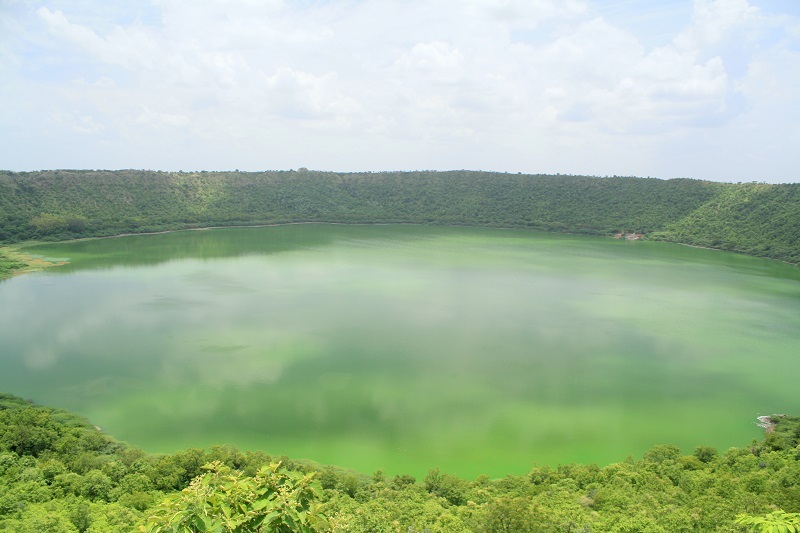 The best time to visit Lonar crater is during the months starting November till late January. The climate remains soothing throughout the day and the temprature do not fluctuates much during this time of the year. MTDC hotels are the best option to stay for all tourist types. But you will need to book online, well in advance to get a confirmed accommodation. You can find more details on the official Maharastra Tourism website.